Monitoring component health is vital for maximizing machine availability and reducing operating costs. Industrial vehicles are subject to variable conditions that undermine their performance and longevity. LORD MicroStrain’s integrated monitoring systems provide a scalable solution to effectively track vehicle health and component use. They are ideally suited for enhanced condition based maintenance (CBM) of heavy-duty construction equipment. LORD MicroStrain’s miniature wireless nodes (for vibration, pressure, load, corrosion, strain, torque, temperature, and orientation) integrate across engines, power trains, brakes, bodies, and cabins. Their wireless design enables rapid integration and installation without any disruption of performance or operation. LORD MicroStrain’s vehicle monitoring systems, including the SG-Link wireless sensor node, track structural strain on off-highway vehicles. 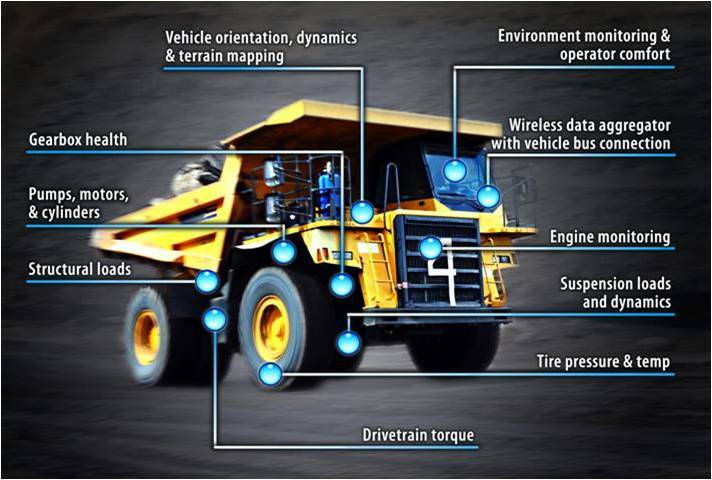 Embedded fatigue tracking algorithms enable automated alerts for streamlined maintenance action and fleet management. Wireless data is aggregated on a base station that supports custom health indicators. It also enables secure communication with SensorCloud™, a remote data management and analytic platform that gives service technicians access to unlimited fleet data for enhanced tracking, reporting, and alerts. As a result, heavy-vehicle operators improve the effectiveness of scheduled maintenance programs, maximize component life, enhance machine availability, and reduce operating cost... all without sacrificing hauling performance.